I’d had a few recommendations over the last few months for this Gallic restaurant on King Street. It really is a Nottingham fixture, having first opened in 1994, so it was about time I got around to a visit. A small dining space at ground level is supplemented but further downstairs setting. The theme is definitely rustic French with exposed brick in the basement and old floorboards upstairs bringing character to the place. I was impressed that there was a specific high-quality printed menu for Spring; more widely there are 2 set menus and an a la carte. We chose the more expensive set menu at £27.90 for 3 courses. Service had a distinct ambivalence about it as I had to get up and flag down a member of staff after a long wait to order. 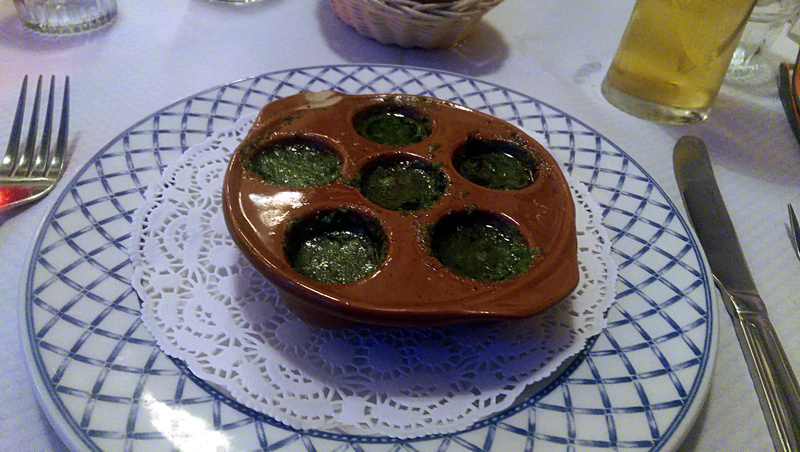 I began with a very French dish of Escargot, that arrived swimming in suitably pungent garlic butter. The snails were disappointing, little pucks of gristle that lacked flavour and contained elements of grit. I got some satisfaction out of dipping the free bread in the garlic butter. A friend had asparagus and smoked ham with hollandaise, which was capable, but not showing off a great deal of technique. 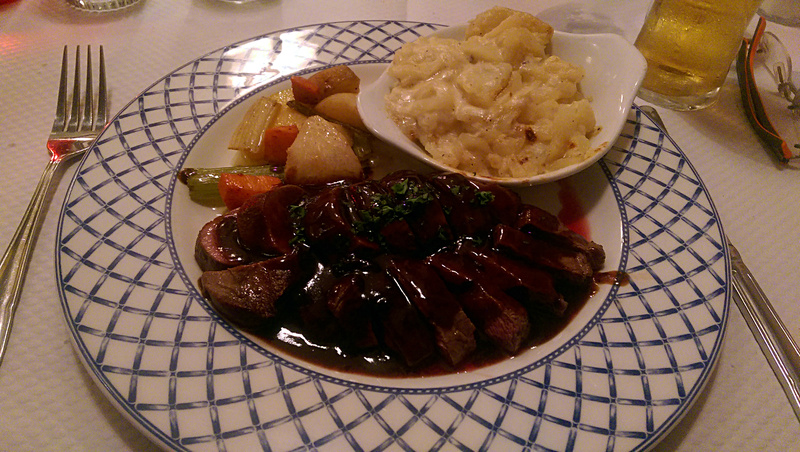 For a main course venison had leapt out at me, and I wasn’t disappointed with the portion of the meat. The deer dominated most of the plate and was smothered in a tangy blueberry sauce. A good gamey flavour and tenderness meant I was much happier than I had been with the starter. That happiness was short lived. The potato dauphinois was the biggest letdown, it didn’t look appealing and what should have been rich and creamy addition was undercooked with a thin sauce. A handful of vegetables were quite nice, though the level to which they were cooked was variable. My friend was certainly underwhelmed with his Halibut that was noticeably overcooked. A tarte au citron was certainly the prettiest dish of the evening. 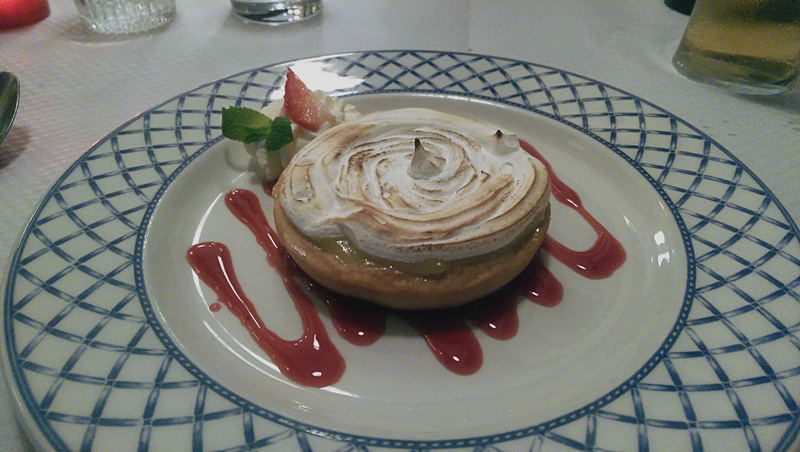 This version was topped with meringue and accompanied by a fruit coulis. The added elements bought different flavours and textures that enhanced the traditional lemon tart style. Whilst I’d love to be entirely positive….it still didn’t quite happen; the pastry was far too thick, I ended up leaving most of it and focussing on the filling. I was significantly underwhelmed by my dinner. The potential is there with seasonal menus, solid quality ingredients, and the odd bit of good cooking on show. The consistency was just not there in meal, I suffered too many disappointments with the food and the slow service was particularly concerning on a night when they weren’t busy. There is also fairly stiff competition for this cuisine in Nottingham and I enjoyed my visits to Bistrot Pierre & Petit Paris significantly more. I may have had those recommendations to eat at French Living but unfortunately I won’t be passing them on. Interesting to read this. About 18 months ago I was able to write positively about It. I returned a few months ago and have to agree that the food quality in particular had dropped. Conistency is everything.